This guide will teach you everything you need to know about Thyroiditis including the complete symptom guide, how to approach treatment and the various types of Thyroiditis (including how to treat and manage Hashimoto's thyroiditis). Thyroiditis is actually just a general term used to describe inflammation localized to the thyroid gland. The trick with diagnosing this condition is understanding the various conditions which may result in inflammation in this specific tissue. These causes range from autoimmunity (your own body attacking itself) to inflammation from viral infections. Thyroiditis refers to a condition which results in inflammation to the thyroid gland in your body. In medicine the modifier "-itis" always means that inflammation is present. So thyroiditis refers to inflammation in the thyroid gland, tonsilitis refers to inflammation in the tonsils and so on. But the presence of inflammation doesn't actually give us very much information about the condition. Because inflammation can be caused from a number of sources (1) including trauma (such as a car accident), infection (from bacteria or virus), immune system response (such as autoimmune disease) and even from a negative reaction to medication. All of these conditions and more can occur in your thyroid gland and result in the general condition known as "thyroiditis". The good news is that regardless of the cause of the inflammation to your thyroid your body will react in certain ways. After all, there are many symptoms that are specific to the thyroid which can help you determine if you have potential damage to the thyroid gland (which we will go over below). The most important part of having thyroiditis is finding the SOURCE or the CAUSE and then focusing your treatment on that. In some cases, thyroiditis may resolve on its own (such as those cases due to viral infection (2)) but in other cases, thyroiditis can smolder along for years and result in long-lasting and permanent damage to your thyroid gland (3) (such as Hashimoto's thyroiditis). If you suspect you have Thyroiditis your primary goal should be to find the source and target treatment to that specific issue. This may seem confusing, and it might be if you have never heard about thyroiditis before, but it's fairly straightforward to most physicians. While there are many different causes of Thyroiditis some conditions are much more common than others. The most common cause of Thyroiditis in the United States is from autoimmune disease (4) which is known as autoimmune thyroiditis most commonly Hashimoto's thyroiditis (we will discuss this more in detail below). The reason this should matter to you is that this condition is surprisingly common, especially among women and may lead to serious long term consequences if not addressed. Your thyroid is responsible for very important functions in the body such as the regulation of your metabolism (and therefore your weight) and the regulation of several other hormones. It's also responsible for managing hair growth, nail growth, skin quality, intestinal motility and so on. Because your thyroid is so important to these various tissues the symptoms of even slight thyroid dysfunction can be very serious. As I mentioned previously we are lucky in that conditions that alter thyroid function tend to present in very specific ways. Hypothyroid symptoms from thyroiditis which means that your thyroid is not producing ENOUGH thyroid hormone. And hyperthyroid symptoms from thyroiditis which means that your thyroid is producing TOO much thyroid hormone. Your thyroid has 1 primary job and that is to secrete thyroid hormone. This means that thyroiditis can either cause your body to produce TOO much of this hormone or too little. This can sometimes get confusing as certain causes of thyroiditis may result in initial overproduction of thyroid hormone (5) followed by insufficient thyroid hormone production over time. This can give you a "roller coaster" set of symptoms in which you may alternate between hyperthyroid and hypothyroid symptoms week by week (6). Because your symptoms may alternate it's important to have a solid understanding of what your symptoms may mean and whether they are due to insufficient thyroid hormone or excessive thyroid hormone. You will notice that these symptoms track with the symptoms of hypothyroidism which you can read more about here. These symptoms also may vary in severity. Meaning some people may experience extreme fatigue while others experience minor fatigue and so on. These symptoms are almost the exact opposite as the symptoms listed above and are primarily related to excess thyroid hormone circulating in the body and bloodstream. Remember that thyroiditis can result in either hypothyroid symptoms or hyperthyroid symptoms and these may alternate throughout the course of the disease. Patients tend to experience hyperthyroid-like symptoms initially which then tend to turn into hypothyroid symptoms over time. This tends to be the case for most causes of thyroiditis but it isn't universal and the symptoms you experience may be slightly different. Remember also that thyroiditis is the result of some other issue and this primary issue may also present with some symptoms. If your thyroiditis is the result of Hashimoto's thyroiditis then you might also experience symptoms related to immune dysregulation such as frequent illness or other autoimmune diseases (7). If your thyroiditis is the result of an infection then you may also experience the symptoms of malaise or body aches associated with that virus (8). Don't let these symptoms confuse you! The more generalized symptoms associated with Thyroiditis may appear first and which are then followed by the thyroid-associated symptoms listed above. These symptoms may be hard to identify because they are so non-specific. There are several types of Thyroiditis and I've included the most common below. Pretty much any condition that results in inflammation to the thyroid gland may result in a "type" of thyroiditis, but the diseases listed below represent the vast majority. The most common cause of Thyroiditis in the United States is autoimmune thyroiditis or Hashimoto's thyroiditis. Hashimoto's thyroiditis is actually the most common cause of hypothyroidism (or low thyroid hormone) which is estimated to affect up to 10% of the population (9). It is also estimated that anywhere from 70-90% of all cases of hypothyroidism may be caused by Hashimoto's which means that a great many people have this condition. Hashimoto's thyroiditis is an autoimmune condition in which the body accidentally attacks and damages your thyroid gland thinking that it is "foreign". This attack on your thyroid gland by your own immune system results in inflammation (thus the name Thyroiditis) and ultimately may lead to long term destruction of the thyroid gland if left unchecked. 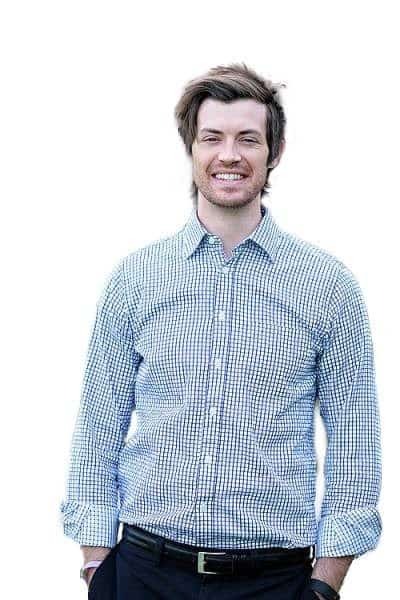 One of the main issues with Hashimoto's is that we do not currently have a great way to treat this disease. In general, most therapies directed at autoimmune conditions tend to suppress or reduce whole body immune function. The problem with these therapies is that while they may temporarily reduce autoimmune attack on the body they also result in other problems such as an increased risk of developing certain rare and potentially life-threatening infections (10). Because these therapies are considered to be dangerous the general approach to Hashimoto's thyroiditis treatment is the "wait and see" approach (11). This approach entails watchful waiting and monitoring of thyroid serum levels including the TSH and free thyroid markers until it appears that the thyroid is no longer functioning optimally. At this point, the patient is then put on thyroid hormone replacement medication indefinitely. This type of treatment is not well received by many patients who take it upon themselves various alternative therapies with varying degrees of success. Alternative therapies designed to treat Hashimoto's include dietary changes (such as the AIP diet), lifestyle changes (to reduce stress), certain supplements to treat nutrient deficiencies and specific medications (such as LDN or low dose naltrexone). These alternative therapies can absolutely work for some individuals and it's worth evaluating your specific case to determine if they are worth a try. Hashimoto's Thyroiditis tends to present with alternating hyperthyroid and hypothyroid symptoms as well as alterations in serum TSH and free T4 levels. If left untreated this condition usually results in complete thyroid glandular damage and reliance upon thyroid hormone replacement medication. Initially, you can see a spike in the TSH up to 60 mU/I which likely indicates extreme hypothyroidism, which is then followed by near TSH suppression and likely symptoms of hyperthyroidism during this time. 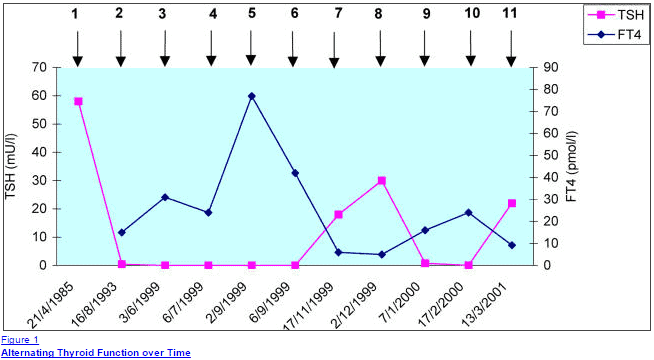 The graph also displays an episodic and alternating pattern which may be typical in patients who have Hashimoto's as they experience "flare up" symptoms. One of the difficulties in treating this form of thyroiditis has to do with the underlying pathology which creates the condition in the first place - your immune system. We don't completely understand what causes autoimmune disease but several factors are likely contributing which you may be able to address in your treatment. Molecular mimicry which may start in the intestinal tract from increased intestinal permeability (12) - The idea behind this mechanism is that damage to the intestinal lining allows for the absorption of materials (bacterial particles, chemicals, etc.) which may enter your bloodstream and cause an immune reaction which results in damage to your own body. Extreme or constant stress (13) - This stress can be caused by social issues, physical issues or even emotional reasons. Stress may not directly cause Hashimoto's but it seems to be an environmental factor associated with the genesis of the disease. Viral infections such as EBV and CMV (14) - Certain viral infections, such as EBV, may lay "dormant" in the body but ultimately lead to white blood cell activation and recruitment to target areas (in this case the thyroid gland). EBV is actually very common, so not all individuals who have EBV get Hashimoto's. Excessive Iodine intake (15) - High levels of iodine may trigger an increase in antibodies but this doesn't necessarily mean that iodine itself causes thyroiditis. In some cases, repleting iodine may increase the iodination of thyroglobulin which gives the immune system more surface area for attack, which may result in increased antibody levels. Exposure to certain chemicals (16) - Industrial chemicals may trigger thyroid autoimmunity in both animal models and human models. It's not known how these chemical result in thyroiditis but it is known that certain chemicals such as polyaromatic hydrocarbons or polyhalogenated biphenyls increase the risk of developing thyroiditis. The idea behind treating Hashimoto's is to target therapies at the potential causes of the disease. If Hashimoto's was triggered by chemical exposure then removing that exposure and attempting to remove those chemicals from your body may potentially treat the underlying condition. Some circumstances (such as exposure to stress) may not be reversible, but certain therapies may be able to reduce your symptoms or your risk of a flare-up. For most patients recovery does not occur if you've been diagnosed with Hashimoto's thyroiditis. The ultimate progression of the disease is one that results in thyroid glandular damage which may lead to reliance upon thyroid medication for the rest of your life. Some cases of recovery have been reported, however (17). In clinical practice it may be possible, through the use of alternative therapies, to mitigate the damage of this disease on your thyroid gland. Thyroid damage tends to be permanent in patients who are diagnosed with Hashimoto's thyroiditis. Not all patients will have complete thyroid glandular damage, but if the autoimmune attack continues for long periods of time (usually decades) then the risk of permanent damage increases over that time period. Will I need to take thyroid medication? Many patients with Hashimoto's thyroiditis will end up on thyroid hormone replacement medication such as levothyroxine, Synthroid, NDT (such as Armour thyroid) or T3 therapy. If you can avoid permanent thyroid glandular damage then you may be able to avoid using thyroid hormone replacement medication. Subacute thyroiditis is another common cause of thyroiditis (18). This condition differs from Hashimoto's and other causes of autoimmune thyroiditis in that it usually follows a predictable clinical path (19). What this means for the patient is that in 90% of cases you can "expect" certain things to happen and complete resolution usually occurs without treatment within a few weeks to several months. Patients often experience very intense pain in their throat, especially to the touch. This is often accompanied by general symptoms such as fatigue, body aches, and fever/chills. This stage of the disease usually lasts 1-2 weeks. The second stage of the disease often presents with the symptoms of thyrotoxicosis or symptoms commonly associated with hyperthyroidism. During this stage, your thyroid is responding to the inflammation in the gland with excessive thyroid hormone release. Lab tests tend to show excessively high serum free thyroid tests with a suppressed or low TSH. This stage usually lasts a few weeks. Following the excessive release of thyroid hormone the body usually goes into a state of hypothyroidism. This stage results in a decreased release of thyroid hormone and is often associated with the symptoms of hypothyroidism. This stage tends to last 1-2 months. The fourth and final stage is the recovery stage in which your thyroid returns to normal, the pain subsides and you are able to produce thyroid hormone on your own again. Believe it or not, we aren't actually sure what causes Subacute thyroiditis. It is felt that this condition is most likely the result of a viral disease or some other infectious process. What is not known is whether or not the infection is localized in the thyroid gland or if the thyroiditis is the result of your body's immune response to certain infections (20). 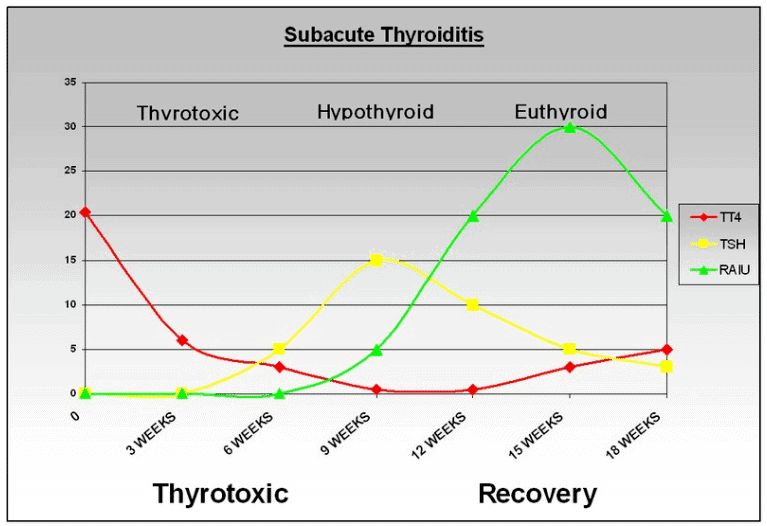 Most cases of Subacute thyroiditis will result in complete recovery over a 2-4 month time frame. The good news is that in the majority of cases (over 90%) this disease is considered to be self-limited. Self-limited is a term used in medicine which describes that it often goes away on its own without treatment. So in most cases, Subacute thyroiditis will NOT result in permanent damage. Most patients do not require treatment or even thyroid hormone medication if they have this disease. Each individual case may vary, but most patients recover over time without intervention. Postpartum thyroiditis is considered to be a transient (meaning temporary) form of Hashimoto's thyroiditis that is triggered by pregnancy and the postpartum period. Up to 7.5% of pregnant women may experience this condition (21) so it is actually quite common. Pregnant women tend to have a naturally suppressed immune system which is required so they don't attack their own baby. It is felt that this change in the immune system may allow certain and susceptible women to develop Postpartum thyroiditis. This type of Thyroiditis is very similar to Hashimoto's thyroiditis in that it is an autoimmune disease mediated by your own immune system. The main difference is that most women who have this condition will experience complete recovery over the course of 1 year (about 75% of women). Postpartum thyroiditis can occur up to 1 year after pregnancy and can even occur in women who have had a miscarriage. It is very important to be diagnosed with this condition because the symptoms of postpartum thyroiditis may result in depression, infertility, weight gain, constipation and other symptoms of hypothyroidism. First is that many women will develop antithyroid antibodies in their bloodstream during the first semester of pregnancy. The presence of these antibodies in the serum does NOT mean that the pregnant woman has Hashimoto's but the presence does indicate an increased risk for developing postpartum Thyroiditis. It is estimated that about 50% of women who have elevated serum TPO antibodies in the first trimester of pregnancy will go on to develop postpartum thyroiditis. Another important reason to identify the presence of this type of thyroiditis is that its presence dramatically increases your risk of developing Hashimoto's and hypothyroidism later in life (22). Postpartum thyroiditis is usually diagnosed based on serum thyroid lab tests and on symptoms. 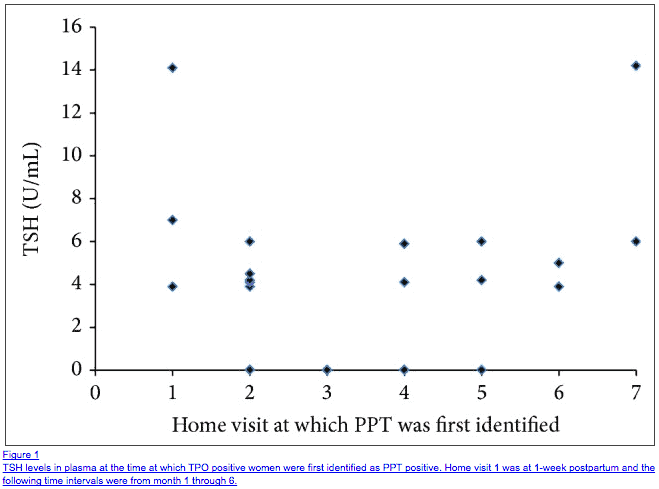 This data set it shows that most women who present with postpartum thyroiditis have a TSH greater than 4.0 U/ml at the time of diagnosis (23) with some having a considerably higher TSH. Postpartum thyroiditis is thought to be triggered by the natural suppression of the immune system that occurs during pregnancy. Changes to immune function result in increased susceptibility to the development of certain autoimmune diseases. Most women will recover completely from this form of thyroiditis within a 1-year time frame. In 75% of cases, the symptoms associated with postpartum autoimmune thyroiditis will completely resolve over the course of 1 year. About 25% of patients with this condition may go on to develop permanent hypothyroidism in the following 10 years or so. Treatment for these conditions varies considerably from woman to woman and depending on her individual circumstances. Because postpartum thyroiditis can present with temporary symptoms of hyperthyroidism and hypothyroidism the treatment differs between both groups. Some women will require treatment for hyperthyroidism and if that is the case a short course of a medication known as beta blockers is usually sufficient. Beta blockers help to block the effects of excessive thyroid hormone on your tissues (24) and blunt many of the symptoms associated with hyperthyroidism. Women who experience hypothyroidism with a TSH greater than 5.0 to 10.0 mU/I (25) may require temporary thyroid hormone replacement therapy. Women who are attempting to get pregnant and who are symptomatic should take thyroid hormone medication during this time as hypothyroidism will reduce the chance of fertility. If you need therapy (not all women will) therapy depends on whether or not you have hyperthyroid symptoms or hypothyroid symptoms. Women with excessive hyperthyroid symptoms may need a short course of beta blockers. Women with hypothyroid symptoms (especially if they are trying to conceive) may need thyroid hormone medication. This form of thyroiditis is referred to as silent because many of the symptoms associated with this form of thyroiditis are not present in others. In fact, most people who present with silent thyroiditis have a transient (meaning temporary) period of hyperthyroid symptoms due to thyrotoxicosis. These patients don't have any pain in their thyroid gland during this time period (unlike other forms of Thyroiditis such as subacute thyroiditis). Patients with this condition typically present with hyperthyroid-like symptoms which spontaneously resolve over a 2-12 week period (26). This form of thyroiditis is may also be related to an autoimmune-like condition. One primary concern with this condition is to differentiate it from other long term causes of hyperthyroidism such as Graves' disease. Lab tests at diagnosis tend to show a low or suppressed TSH with elevated free thyroid hormone markers. It is not well understood what causes silent thyroiditis but it may be due to an immune reaction. There may be a relationship between Graves' disease (27) and silent thyroiditis as an increased percentage of patients who develop silent thyroiditis may go on to develop Graves' later in life. 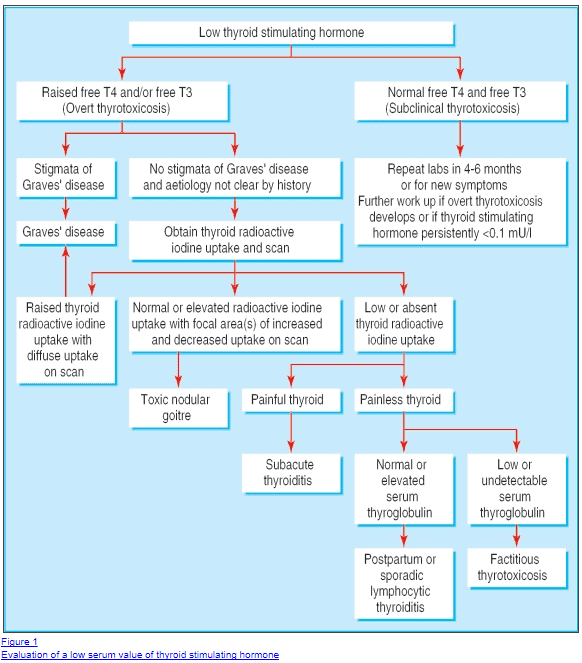 So much like postpartum thyroiditis may go on to develop Hashimoto's or autoimmune thyroiditis (and therefore hypothyroidism), this sequence of events may also continue with Silent thyroiditis which may go on to develop Graves' in certain patients. The difference between these conditions may simply be the genes involved. Complete recovery is usually observed within a 2-12 week period. In the vast majority of cases, there is no permanent damage to the thyroid gland. Most patients do not need thyroid medication but they may need beta blockers depending on their symptoms. It is well known that many drugs and medications interfere with thyroid function in the body. Medications that interfere in thyroid function may alter thyroid hormone production or synthesis, thyroid hormone transport, thyroid hormone conversion or alter production of precursor hormones such as TSH. Despite many medications known to interfere with thyroid function only a small fraction of these medications actually result in serious clinical symptoms. Certain medications, such as Lithium, are well known to cause thyroid dysfunction in up to 5-15% of patients (28) on this medication experience over hypothyroidism. The good news is that treatment for this condition revolves around changing your medication or removing your medication (if that is an option to you). Other drugs which are known to cause thyroid damage include interferon, molecular-targeted agents, amiodarone, thyroid hormone itself (such as thyroid hormone medication), lithium and iodine (29). Each medication will alter thyroid function in various ways, but it is usually a direct result of the medication itself or its metabolism which causes the problem. Once the medication is discontinued you should begin to see improvements. In most cases, the damage to your thyroid is only temporary. If you can not stop the medication you are taking or if you've been taking the medication for years then you may require some thyroid hormone replacement therapy. Most cases of drug-induced thyroiditis do not require thyroid hormone medication. Treatment for Thyroiditis should be targeted at both the cause of the condition and at any symptoms that you may be experiencing (whether they be hypothyroid or hyperthyroid). Hashimoto's thyroiditis - At this time there are not many conventional therapies used to treat Hashimoto's thyroiditis but there are many alternative therapies that include changes to diet, stress reduction, medications such as LDN, supplements and so forth. You can read more about those therapies here. Subacute thyroiditis - In most cases, subacute thyroiditis does not require treatment. Postpartum thyroiditis - In most cases, treatment is not necessary for postpartum thyroiditis. Silent thyroiditis - In most cases, treatment is not necessary for postpartum thyroiditis. Drug-induced thyroiditis - Your goal should be to discontinue the medication causing the issue or reduce the dose if at all possible. If that isn't an option then long term and permanent damage may ensue. For most cases, patients who experience thyrotoxicosis may only need beta-blocker therapy for a brief period and only to help with symptomatic control. Some patients may not even need therapy as their symptoms may only be minor. T4 thyroid medication - T4 medications include Levothyroxine, Synthroid and Tirosint. T3 thyroid medication - T3 medications include Cytomel and Liothyronine. T3 + T4 thyroid medication - These combination medications include Armour thyroid, WP thyroid and Nature Throid. No medication - Even if you are experiencing the symptoms of hypothyroidism you may not need medication. Some causes of thyroiditis may be completely reversible and all that you need to do is give your condition some time. Thyroiditis is a general term used to describe a condition of inflammation in the thyroid gland. Patients with this condition most often present with either the symptoms of hyperthyroidism or hypothyroidism. Many of the causes of Thyroiditis are completely reversible and require very little treatment, but conditions such as Hashimoto's thyroiditis may result in permanent thyroid gland damage over time. If so, which kind do you have? What therapies have worked for you?